It’s that time again: time for cicadas in Australia (2018-2019)! Are you in the Sydney area? Report cicada sightings to The Great Cicada Blitz (Sydney, AUS). When is it out: late Sep-Dec, peaking in November. Photo by Kevin Lee. Yellow-Green Green Grocer with Mask. When is it out: Nov-Feb, peaking in December. When is it out: January. When is it out: Dec-Jan, peaking in January. When is it out: Sep-Jan, peaking in October. L. Popple’s website The Cicadas of Australia, is the best site for Australian cicadas. Follow @_DrPop_ on Twitter. Nathan Emery’s Great Cicada Blitz. Follow Nathan on Twitter @ecotechnica and on Facebook. Nathan Emery released a cicada book called “A photo guide to the common cicadas of the Greater Sydney Region”. You can purchase it on eBay. Common names of Australian insects. Atlas of Living Australia Cicada page. Laura Imbruglia sings songs that mention Green Grocers and Yellow Mondays on her album “It Makes a Crunchy Noise”. January 15, 2019: Black Prince (Psaltoda plaga). Millions of them in Bendalong NSW reported by David Barr via email. December 31, 2018: Floury Baker (Aleeta curvicosta). Reported by @GB_Wildlyf on Twitter. 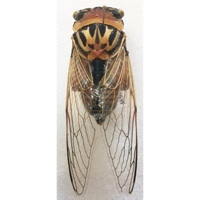 December 21, 2018: Marbled Bottle Cicada (Chlorocysta suffusa) . Reported by Lindsay Popple on Twitter. December 20, 2018: Brown Bunyip (Tamasa tristigma). Reported by Nathan Emery on Twitter. December 17, 2018: Razor Grinders (Henicopsaltria eydouxii). Reported by EmmaCCroker on Twitter. December 16, 2018: Black Prince (Psaltoda plaga). Reported by . December 2, 2018: Red Ringers. Reported by @GB_Wildlyf on Twitter. October 31, 2018: Small Bassian Ambertail (Yoyetta landsboroughi). Reported by ozzicada on iNaturalist. October 21, 2018: Alarm Clock Squawker (Pauropsalta mneme), Sandstone Squeaker (Atrapsalta corticinus sp. complex) & Fence Buzzer (Myopsalta mackinlayi) . Reported by Nathan Emery on Twitter. October 16, 2018: Zipping Ambertail (Yoyetta repetens), Ferny Acacia Cicada (Clinopsalta autumna), Southern Red-eyed Squeaker (Popplepsalta notialis) and Southern Bark Squeaker (Atrapsalta corticinus). Reported by Nathan Emery on Twitter. October 3, 2018: Small Bottle Cicada (Chlorocysta vitripennis). Reported by dianneclarke on iNaturalist. September 28, 2018: Green Grocer (Cyclochila australasiae). Reported by EmmaCCroker on Twitter. September 19, 2018: Alarm Clock Squawker (Pauropsalta mneme). Reported by njemery on iNaturalist. 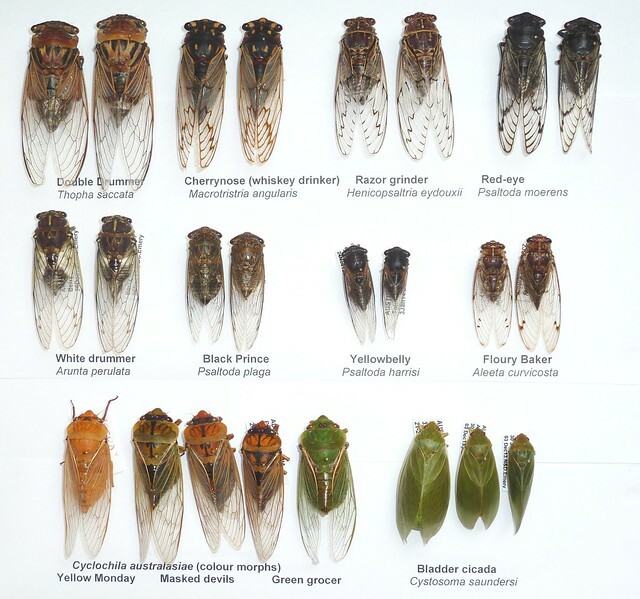 This might be handy for guessing when cicada species in Australia will emerge. January 19, 2018: Creaking Branch Cicada (Auscala spinosa). Gemma Edwards found one in Bendigo, Victoria, outside of their previously known geographic distribution. December 18, 2017: Razor Grinders (Aleeta curvicosta) and Redeye cicadas (Psaltoda moerens), reported by Mike Young on Facebook. December 14, 2017: Southern Red-eyed Squeaker (Popplepsalta notialis notialis), reported by NJE Photography on Facebook. November 20, 2017: Cherrynose (Macrotristria angularis), reported by Nathan Emery on Twitter. November 11, 2017: Golden Twanger cicadas (Diemeniana euronotiana), reported by NJE Photography on Facebook. November 8, 2017: Eastern Double Drummer cicadas (Thopha saccata), reported by NJE Photography on Facebook. October 3, 2017: Cyclochila australasiae (Green Grocer, Masked Devils, Yellow Mondays, Blue Moons), reported by Brian G on Flickr. (thx David Emery for pointing this out). September 24, 2017: The Silver Princess (Yoyetta celis), reported by Nathan Emery on Facebook. September 14, 2017: Clinopsalta autumna reported by Nathan Emery on Twitter. September 12, 2017: Cystosoma saundersii reported by Nathan Emery on Twitter. August 11, 2017: Birrima varians calling in Brisbane reported by Lindsay Popple on Twitter. We live on a farm at Lorne just outside Kendall NSw and the cicadas have been deafening this summer. Interestingly I have found no bladder cicadas this year and very few green grocers all the other varieties have been in abundance though. My granddaughters have had a marvellous time collecting and identifying them. Hello. We have just returned from a couple of days camping on a property we have bought up near Gloucester/Barrington Tops in NSW. The noise from the cicadas was deafening. I’m wondering if you might be able to tell me which species they are likely to be in that area and if they they are likely to sing so loudly and in such large numbers in future years. Many thanks. The loudest species is the Double Drummer/Thopha saccata — might be that. See http://dr-pop.net/saccata-003.htm for a sound sample. Plenty of Floury Bakers in the lower Blue Mountains right now. One flew in my car window as I was driving. It hit my shoulder and flew into the back seat. Upon recovering it, I noticed that its abdomen had popped off quite neatly. The poor bloke was still very much alive 6 hours later. Is this some kind of defense, like skinks dropping their tails? We just moved to Artarmon area, very near to the station, and was surprised to hear the loud singing of Cicadas. Though it might be music to some, I wanna know when do they stop. And are they dangerous ? My 3yo often go around them. They aren’t dangerous in that they’re not venomous not do they transmit disease. Prolonged exposure to their song might cause hearing damage though. Double Drummers can get up around 120db. Definitely don’t put one up to your ear. Just recorded some video of an absolute plague of Floury Baker, and what I thought were Black Princes, but after looking at some photos on this site I now think may be Red Eye,cicadas in my backyard at Elanora Heights, on Sydney’s northern beaches. Missing is the Black Prince which was almost mythical and the dream of each kid to find one (I did it was very small). The female Green Grocers were called “Pissers because they sprad a clear liquid on you. For us kids, who lived in Lane Cove, to catch them it was a sin to get them when they came out of their shells and were still wet. We believed if we gave a thousand wings to a certain company, they would give a wheel chair to a poor kid. Since the Green Grocers had a four-year cycle and the Yellow Bakers a three-year cycle ever twelve years their emergence would coincide and the din was unbelievable. On off years just a few would come out. “Blue moons” could occur wherever there are “green grocers” with an estimated frquency of 1/10000. But strangely enough, despite the absolute huge numbers of GGs about this 2013 season from September, no blue moons seem to have been found/ photographed/ handed to the Australian Museum. Claudine’s “indelicate” is probably the nickname given to female cicadas as males croak loudly when caught, females only can excrete water! Chris, what species cam to dive into the pool? WOW……what a site. Last night we had a late night swim in the pool and turned the lights on. Big mistake. There were cicadas coming from every here. Spent our time rescuing them all. We are in the Hawkesbury district. I am over the moon about the number of cicadas. We start them singing by shining a torch in the trees at night. Fabulous. As a child I collected cicadas in Sydney. The boys taught me all the names & one of them is not mentioned probably because it is indelicate. It was called the Pisswacker presumably because it made no noise and released water on you , it was probably a female and did this when caught. I am sitting in my mums backyard listening to their song and little else. I remembered the black price also but couldn’t remember the green grocer. Thanks for the memory kick is getting much more difficult as I approach my 60th.today is mums 86th. where could you find the blue moon around Australia ?? Near Sydney (according to L. Popple). I’ve also read that they are more prevalent in hilly areas. How much is it possible? Excellent page. Reminder of the glorious days of summer when I was a youngster. Why were they known as “locusts” 50 years ago? I think they called them locusts because they reminded people of the locusts that are actually grasshoppers. That ‘chocolate soldier’ one is actually a ‘red rocket’ but i think the names for the other ones are very clever. My fav one is the blue moon how beautiful.